The Asian elephant Elephas maximus and the African elephant, Loxodonta africanaare not only regarded as different species, but also belonging to different genus. Crossbreeds between two individuals, belonging to the same genus, but different species, are in most cases sterile, like the the mule, while a crossbreed between to genus was regarded as impossible. So when the Asian elephant cow "Sheba" in Chester Zoo, England, 1978 gave birth to a calf with an African elephant bull" Jumbolino" as father the scientists became puzzled. The staff had observed several matings between the elephants, but since a cross was impossible, noone expected a delivery. The male calf, named Motty, had an African elephants cheek, ears and back,while nail numbers, (5 front, 4 hind) and the single trunk finger were like Asians. This sensational elephant died two weeks after the birth. It was an early birth and Motty had stomach problems. Thres no real evidence however, that there is any genetical difference preventing this type of crossbreeding, since the two species has the same numbers of chromosomes. 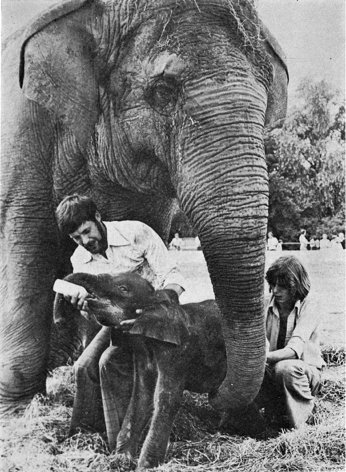 Dr Derek Lyon was veterinary in charge at Chester Zoo during Mottys birth. "I hope you find the following of some interest as several people believed thatour cross-bred never occured! Believe me it did.The following is a brief resume. Mother "Sheba"-arrived Chester Zoo 13/2/65 aged 9yrs. Had a dead Asian babyborn 26/10/74-father "Nobby"(Asian). Sheba's second pregnancy was result of mating with African bull"Jumbolina"(Bubbles).Bubbles arrived at Chester on 14/8/64 from the NorthRhodesian Wildlife Conservation Society. "Motty" was born on 11/7/78.The suspicion of pregnancy was somewhat doubted at the time as it was ONLYpossible for her to be pregnant to with "Bubbles" and crossbreds were notbelieved to have been possible. "Nobby" had been destroyed at a time earlierthat would have been impossible for him to have been the father. Clinical signs during "Sheba's" pregnancy consisted of the appearance of afluid filled area along the ventral abdominal wall in Feb 1978.By May 1978this swelling had persisted and increased in size to about 2 feet in lengthand 7-8 inches wide.By 1/7/78 the swelling had gone(oral diuretics had beengiven previously)and abdominal enlargement was noted,particularly on the left hand side. For several months during the later stages of her pregnancy "Sheba" spent aconsiderable amount of time on her own.On 10/7/78 parturition initiallystarted with production of small amounts of a milky vulval discharge. "Motty"was born in the outside paddock at 9.20am on 11/7/78. Foetal membranes wereremoved by the keepers and the placenta followed almost immediately. The other Elephants were taken and kept inside away from "Sheba" and calf who both remained outside.From the calf's size it was thought to bepremature(? ).Initially, hourly feeds of glucose were given and later that daysupplemented by hourly feeds consisting of cow's milk/Shebas colostrum/Duphalyte (electrolytes, vitamins, amino acids and dextrose) and A-vitamin supplement(Abidec). The calf during this time had not yet stood. By9.20pm on 12/7/78 the calf was standing and walking after 36 hrs of recumbencysince his birth during which time the keepers had aided and encouragedstanding by packing straw beneath the calf. On 13/7/78 "Sheba" and "Motty" were introduced to the rest of the herd on the outside paddock and the calf later allowed to the inside house for the first time. Hourly bottle feeding continued up to 12.30pm on 14/7/78 when it was possible for the calf to suckle from"Sheba" for the first time. By 10.00 pm on 15/7/78 "Motty" was suckling normally and bottle feeding was stopped. On 18/7/78 the calf developed an umbilical infection-treated with oral and topical antibiotcs. After 48hrs the calf appeared to have recovered and wasfeeding and sleepng normally. At 9.00am on 21/7/78 the calf was found comatoseand dying and despite being given extra warmth,cardiac stimulants, artificialrespiration and chest massage died an hour later. Post mortem revealed death tobe due to necrotic-enterocolitis and E coli septicaemia. Consultant Derek Lyon was Veterinary surgeon at Chester Zoo for 30 years, and is now an active member of the British Veterinary Zoological Society. "Elephant", Volume 1, Number 3, pages 36-41. "Elephants: Majestic Creatures of the Wild", pages 168-171. "The Proboscidea: evolution and palaeoecology of elephants and their relatives", pages 53-54.